We’re excited. They’ve been returning in waves over the last few days. 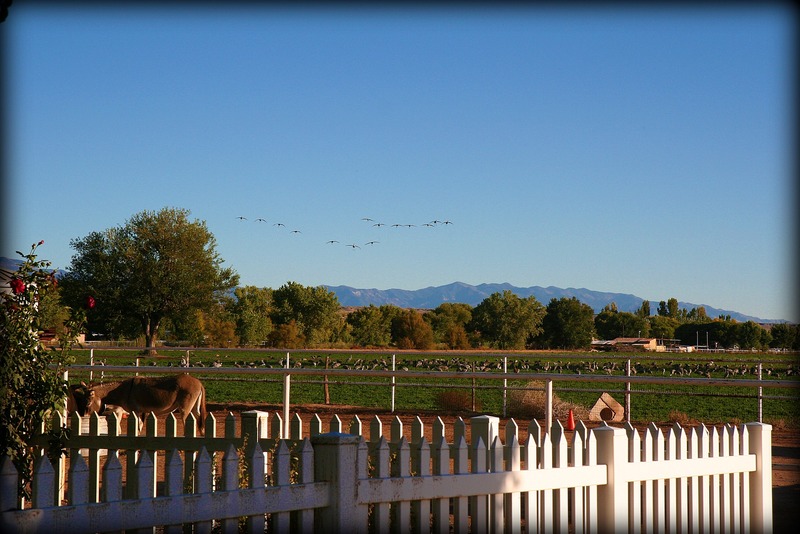 The sandhill cranes are back. I remember reading somewhere that they are one of the loudest, if not the loudest bird species. This is their unison call. Unison calls are produced by a pair of birds. This call, performed with the birds standing close to each other and in a synchronized duet, is a way of reinforcing the pair bond between a female and a male bird. It may also be used by a pair to threaten predators or other cranes. That’s exactly what they sound like when we come upon them trail riding. Didn’t know it had a name. Anyway, I think I’ll keep coming back to this link while I miss the crans in WI this winter. I think that HUGE flock (or one just like it) was up here just two weeks ago. We went on a trailer outing, and saw hundreds of these gathering in the corn fields for the flight south. Magnificent to see so many at one. Enjoy them and then send them back in May, okay? I can remember seeing them for the very first time when I moved here from Maryland. I think I saw a lone flock of five and remember being sooo excited. I could have never imagined the masses we’d be seeing and that they’d be spending every winter with us! Justina you are so fortunate to see these in your backyard. We see them in the spring, but we have to go up to the Platte in Nebraska. LOVE love that sound…. Yep, the cranes were having a pow wow yesterday and we really enjoyed watching them. Also Big Red and Bernard playing….”no I’m biting your neck”. “oh no, I’m biting your neck”. MBF is such a magickal place. Happy cookies. Justina, can you record some Donkey brays? Would love to hear that sound !! You betcha. I’ll be happy to… and I’m positive that the Boyz and Gracie will be willing participants. 🙂 The only one who has never uttered a peep is Nigel. Oh, you lucky girl!!!!!!! I think sandhill cranes are beautiful and we see them only rarely as they fly over. Yes, we do feel lucky. Have a great weekend! I’ll bet the Audubon folks would love to know about this flock. Maybe do a count? I recently read Sandhills have the oldest fossil record of any known bird (2.5 million years old). What is your flock eating? Can you tell? Good question about what they’re eating… I can’t tell. They love the alfalfa field behind us. All cranes are omnivorous. 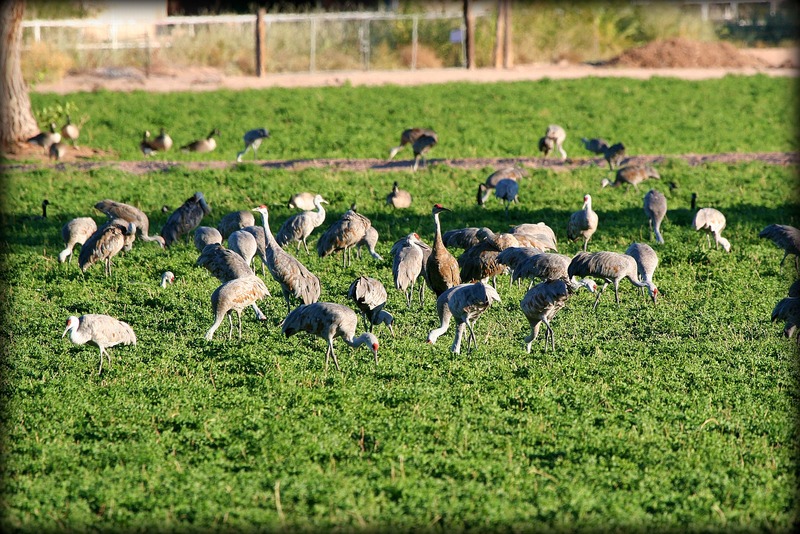 Sandhill Cranes are generalists and feed on a wide variety of plant tubers, grains, small vertebrates (e.g. mice and snakes), and invertebrates such as insects or worms. Sandhills find these foods in uplands and in shallow wetlands. Like most cranes, flightless chicks forage primarily on a diet of insects and other protein filled foods during their early stages of rapid growth. 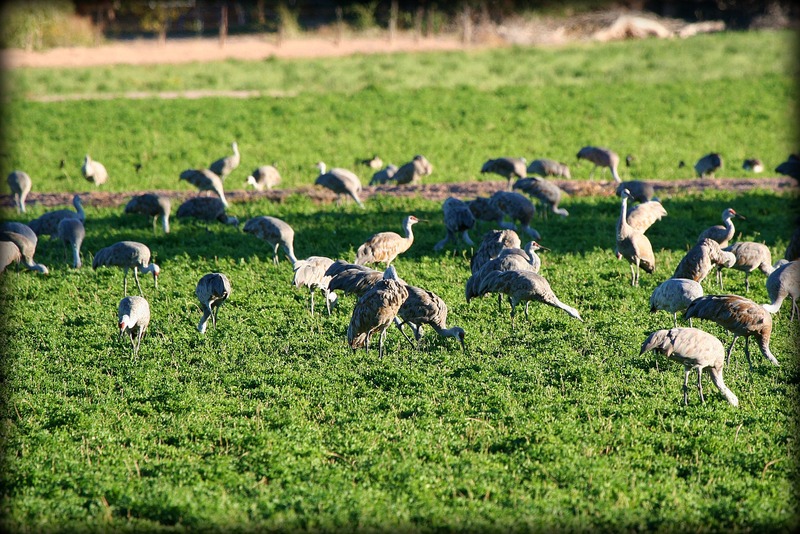 The Sandhill’s tendency to feed on plant tubers creates conflicts with farming. Sandhill Cranes are adept at probing in the ground and finding planted agricultural seeds such as corn. 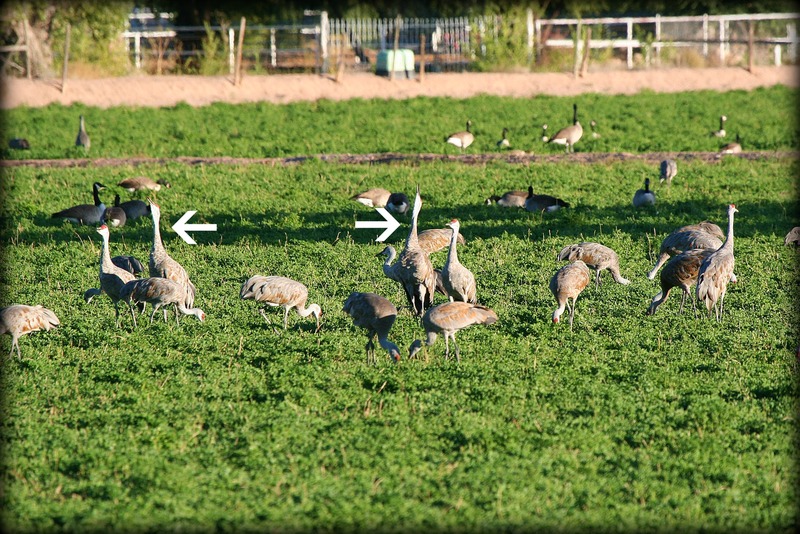 When large flocks of cranes feed on planted fields, the damage they cause to an unprotected crop can be severe enough to force the farmer to replant the entire field. How very cool to have so many in your pasture! Some of their vocalizations sound like purrs! Aw, I love the cranes! Although, I usually have to go to Bosque to see them so I love your pics and audio. Do they scare/annoy the donkeys? Lucky you Justina! What a wonderful noise. They are early this year I think. This morning there is ice on my bird bath and frost on the gras the second day. Oh no. I told you from the photo i took by mistake, four weeks ago. I thought it´s a v of goose I shot. (Together with the moon, wow, big sign, lol.) I thougt that´s for Justina. But zooming in I saw cranes….. maybe on their way to Morning Bray Farm. Maybe? Sure!